Case Study #03 – FUJIYA HONPO, INC.
03 Sep Case Study #03 – FUJIYA HONPO, INC.
Fujiya is a long-established Japanese Sweets manufacturer that has been in business in Hawaii since 1958. The fusion of different cultures, food, tastes and flavors here in Hawaii is what really makes it special and Fujiya Honpo is loved by locals for 60 years as one of the Japanese sweets shop that introduced mochi to Hawaii. Keeping the culture of Japanese sweets and the heart of “omotenashi”, they have been producing “Japa-Hawaiian” products where the local tastes are well collaborated with that of Japanese. Fujiya believes that this fusion of Hawaii and Japan, the spirit and food culture of “Real Japanese Hawaiian” will become the rainbow bridge to the world. “Mochi” started with the hands of Japanese immigrants that settled in Hawaii back then. Although it was at a time where they did not have enough ingredients, due to their strong passion of producing something close to the flavor of Japanese sweets, they made these “Mochi” that were softer than Japanese Daifuku and sweeter—its traditional filling has become peanut butter!—than the so-called Japanese mochi. “Chi Chi Dango” that originated from Hiroshima prefecture’s specialty is also popular amongst not only Nikkei but also locals. Their popular products such as Mochi, Chi Chi Dango and Tropical Tea Cookies that were based on Japanese senbei are produced in their factory in Kalihi everyday. In addition to the head office in Kalihi, they also sell at Shirokiya located inside Ala Moana Center, as well as Japanese supermarkets such as Don Quijote and Marukai, also at Dole Plantation where many Japanese tourists visit. Besides their Hawaiian-Japanese Sweets, they deal in varieties of Arare (Rice Crackers) directly imported from Japan which boast popularity amongst locals. 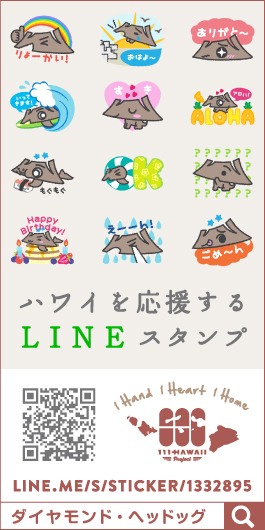 We want to share the greatness of Hawaiian-Japanese Sweets to everyone! Fujiya Honpo has protected the history and culture of Japanese sweets. While keeping it, they have been successful in creating Hawaiian-Japanese Sweets, a fusion of Hawaii and Japanese that are popular from locals. When planning on promoting their sweets to more towards the visitors and the world, they came across 111-HAWAII PROJECT. Both being in a same environment as local small business, they felt that becoming as one with the spirit of Aloha, this project could lead them to advance their business to the world with the power of community-based branding to enhance the value of Made in Hawaii products, thus prompting them to participate in the project. This will become a new item for gifts from Hawaii to enhance the value of Made in Hawaii! The project team discussed how to develop a product that would enhance the value of “Made in Hawaii” with the Tea Cookies that were based on Japanese senbei which are capable of preserving longer. It started from reconsidering the size and flavor. We made them smaller to bite-size, kept the coconut flavor subtle and made this a base. After many trials, we carefully chose the final 6 flavors that would match with the base flavor. 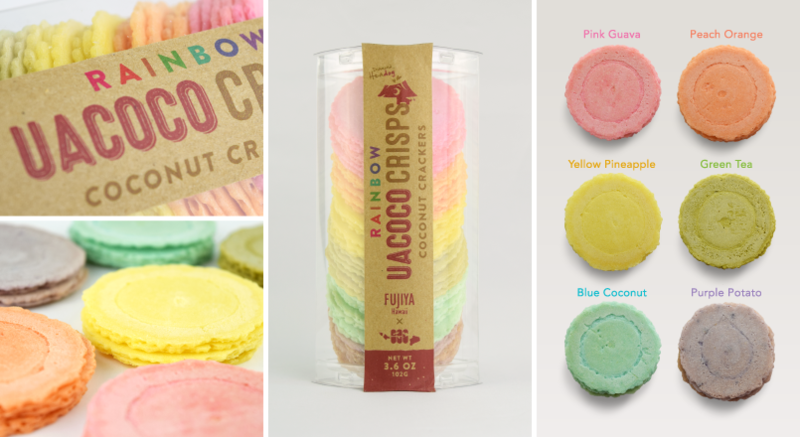 These were put together to create a rainbow color as Rainbow Coconut Crackers to represent Hawaii and provide added value to Hawaii. 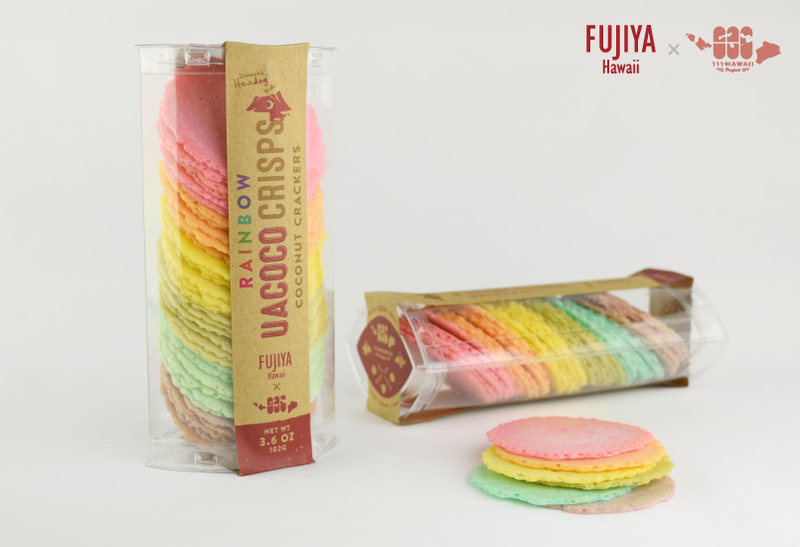 We took the Hawaiian word for “a soft rainbow”, UAKOKO, combined it with COCONUT and named this new sweet snack “UACOCO”. As a “Made in Hawaii” donation product, UACOCO is proud to be the third 111-HAWAII PROJECT collaborative piece.